SYNOPSIS: Las Vegas based Blaxploitation crime rarity. Here's a fun overlooked entry in the 70's Blaxploitation craze. Not as good as Black Caesar but not as bad as Guy from Harlem either! The film kicks off when Roy (Damu King), the leader of a group of convicts, finally gets released from prison. His pals have been waiting for him to get out so they can launch their big plan of robbing the mob controlled casinos and get a little revenge in the process. 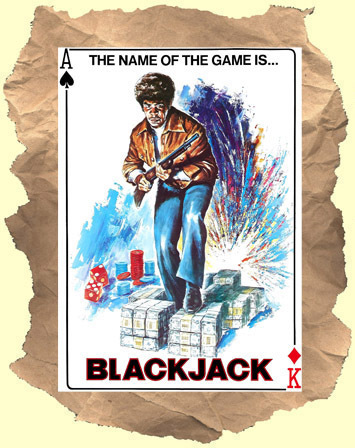 Everyone's favorite 70's bad guy, William Smith, plays the casino boss who clashes with our hero. It's one of his slimiest performances. Plus John Alderman is on hand as a professional hit man! The last 25 minutes of the film is action packed with multiple casino heists, shoot-outs and explosions that are impressive for this low budget film. It's also great to see all the footage (inside and out) of Vegas casinos circa 1978. This one is so obscure it doesn't have so much as a single review the IMDB!